Transmission electron micrograph of a plasma cell from guinea pig bone marrow. Plasma cells are mature B- lymphocytes (white blood cells), which synthesise & secrete the antibodies of the immune system. On contact with an antigen, B-lymphocytes undergo a transformation becoming plasmablasts first & later plasma cells. 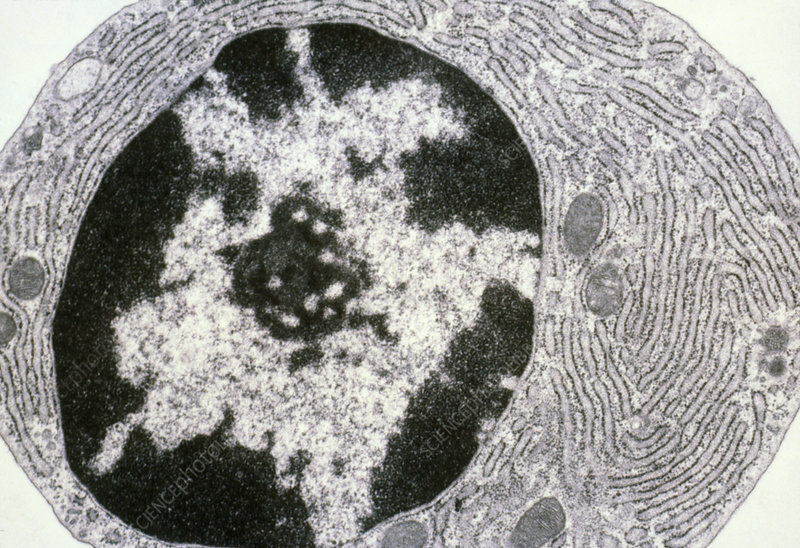 Characteristic of a plasma cell is the arrangement of heterochromatin (black) in the nucleus, which adheres to the inner nuclear membrane. Typical also is the network of dilated rough endoplasmic reticulum (filaments) in the cytoplasm, where protein (antibody) synthesis occurs. When active, these membranes are swollen with synthesised product.